The Suite was first performed at the Edinburgh International Harp Festival in 2010 and subsequently the same year at the Edinburgh International Festival Fringe. It was recorded in 2011. The Megget Valley lies in the peaceful and beautiful Scottish Borders near Cappercleuch and St Mary's Loch. In the 16th century the Scottish Borders, sometimes known as the "Debatable Lands," were populated on both the Scottish and English sides by powerful families constantly warring with each other and with "reivers" or cattle thieves. King James the V of Scotland made it his business to bring them firmly back under his control. In 1529 he sent one of his spies to ascertain that Piers Cockburn of Henderland was at his home on the edge of the Megget Valley. He then came with his soldiers by night, seized and hanged Cockburn, burned down his house and killed all his household. Only his wife, Marjory, escaped. Brokenhearted, she carried his body away to dig his grave and bury him as described in her own words in the Border Widow's Lament. For centuries peace returned to the valley until, in 1983, bulldozers arrived to construct a large earth dam to form a new reservoir supplying water to Edinburgh. The dam, mostly made from the natural materials dug out from the valley floor was then terraced and planted with grass, to blend with the surrounding rolling hills. Houses and farms were moved to higher ground before the reservoir was flooded, leaving behind only a few ruins. Yet again, peace was restored. The Border Widow's Lament and the building of the dam centuries later are the inspiration for the suite, "Megget Valley." Please note that all harps must be tuned in Ab. Introduction: Setting the scene for the ensuing events, this movement is built on a chord scheme which features again later in the music. 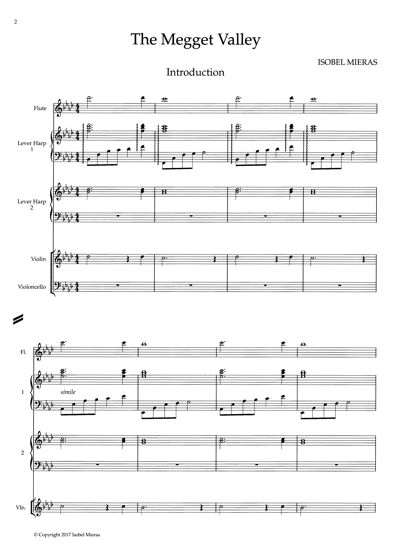 A Pastorale: this is a simple pentatonic melody depicting the rolling green Border hills. It is followed by section B made up of improvised patterns building up the uneasiness as the kings spy watches Piers Cockburn's House and the subsequent attack and slaughter. Using the patterns and sound effects given, build up from the spy's furtive footsteps to the attack and subsequent slaughter of all, except the Border Widow. Directions on how to build up this section are given in the score, but this should be treated freely at the discretion of the Director and appropriate to the numbers and strengths of the performers. C The Border Widow's Lament: the old melody is interspersed with the spoken words of the poem. 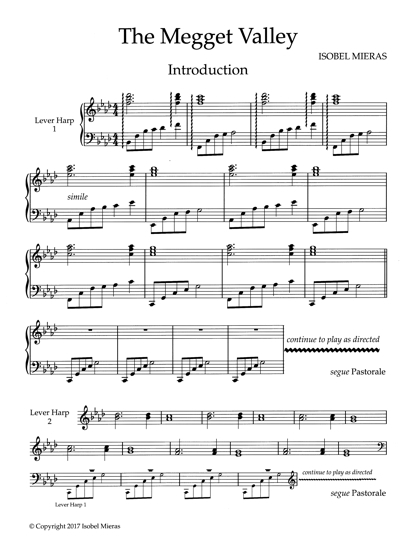 While an order is suggested in the score, the spoken words and the music can be used in any order and even overlap. The bisbigliando section is effective behind the text and at the end to fade out. D Pastorale: Peace returns to the Valley. E is a reprise of the improvised patterns used in section B, this time representing the excavation and building of the dam. This time use the same patterns to build up the distant sound of approaching diggers and bulldozers to the construction of the final majestic dam followed by the flooding of the valley. F Megget Valley Dam: this section uses the same chords as the introduction indicating the strength and beauty of the manmade structure. G Under the Water: this is another "improvised" section, making use of the unique ability of the harp to play pentatonic glissandos to invoke shadows of the lives once lived below the waters of the reservoir. The glissandi are followed by a short melodic passage played by all the harps with a response from a solo harp leading into an underwater jig made up of a series of patterns which build up in tempo and dynamic to sudden stop. A few harps take up the glissandi, allowing the others to change levers back to the original key. Finally, at H the Pastorale returns, as has peace and beauty to the hills of the Megget Valley.. Purchasers of the score / harp parts book are permitted to photocopy the parts but copying of the full score is not permitted. 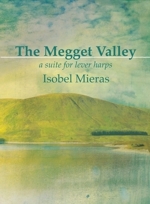 The additional parts (optional) for flute, violin and cello are available to download from www.isobelmieras.co.uk.